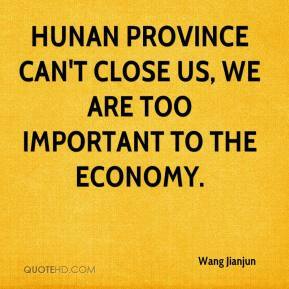 Hunan Province can't close us, we are too important to the economy. 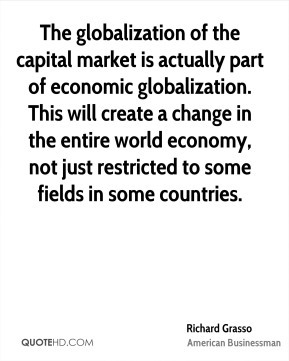 The globalization of the capital market is actually part of economic globalization. 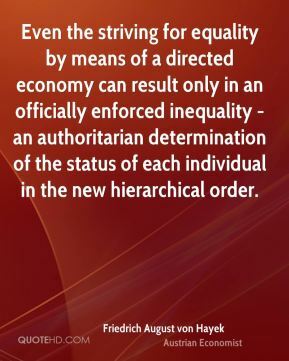 This will create a change in the entire world economy, not just restricted to some fields in some countries. 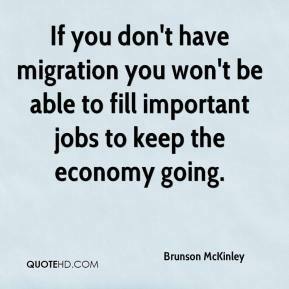 If you don't have migration you won't be able to fill important jobs to keep the economy going. 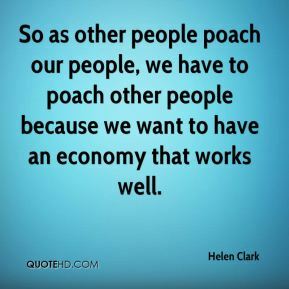 So as other people poach our people, we have to poach other people because we want to have an economy that works well. 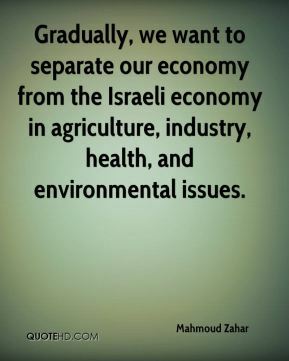 Gradually, we want to separate our economy from the Israeli economy in agriculture, industry, health, and environmental issues. 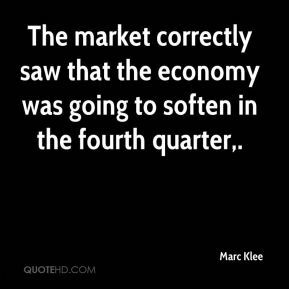 The market correctly saw that the economy was going to soften in the fourth quarter. 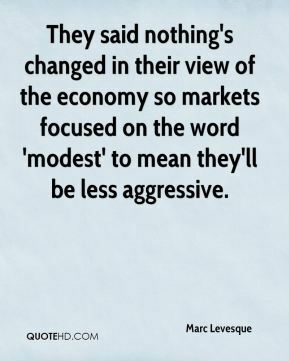 They said nothing's changed in their view of the economy so markets focused on the word 'modest' to mean they'll be less aggressive. 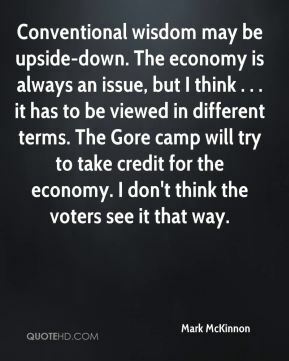 [Bush may cling to his belief that the market's woes won't affect the basic soundness of the economy, but he knows from his father's experience that politicians who don't appear to take voters' pocketbook fears seriously pay for their callousness at the polls.] 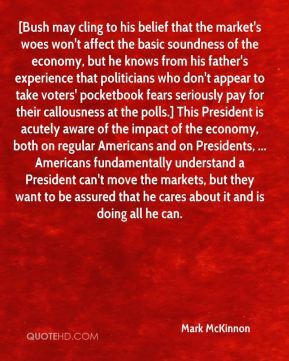 This President is acutely aware of the impact of the economy, both on regular Americans and on Presidents, ... Americans fundamentally understand a President can't move the markets, but they want to be assured that he cares about it and is doing all he can. 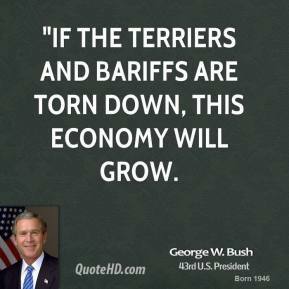 [But a weak economy also means job loss and relocation are more likely.] 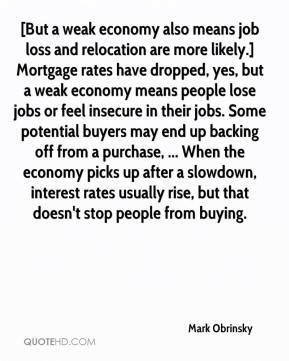 Mortgage rates have dropped, yes, but a weak economy means people lose jobs or feel insecure in their jobs. Some potential buyers may end up backing off from a purchase, ... 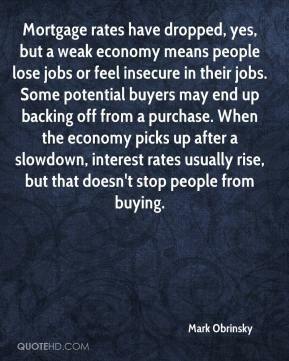 When the economy picks up after a slowdown, interest rates usually rise, but that doesn't stop people from buying. There was nothing normal about those times. 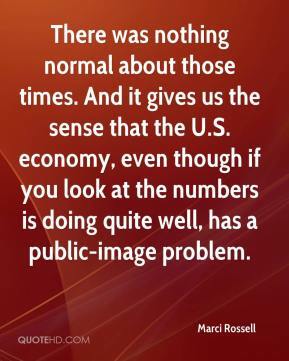 And it gives us the sense that the U.S. economy, even though if you look at the numbers is doing quite well, has a public-image problem. 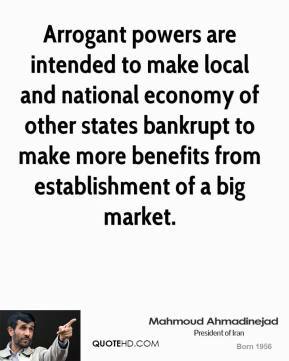 Making important energy policy that affects national security, the economy and public health is too important to be done behind the closed doors of a conference committee that avoids public hearings or the scrutiny of the full committees of each chamber. 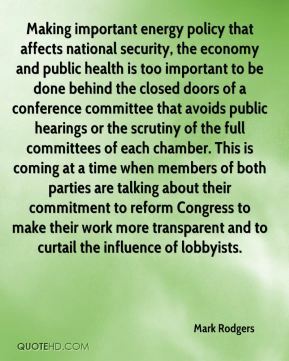 This is coming at a time when members of both parties are talking about their commitment to reform Congress to make their work more transparent and to curtail the influence of lobbyists. 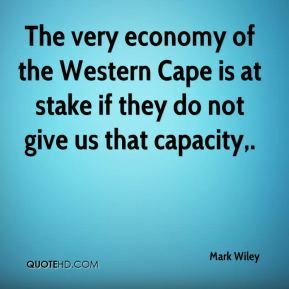 The very economy of the Western Cape is at stake if they do not give us that capacity. 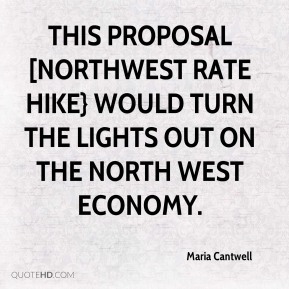 This proposal [Northwest Rate Hike} would turn the lights out on the North west economy. 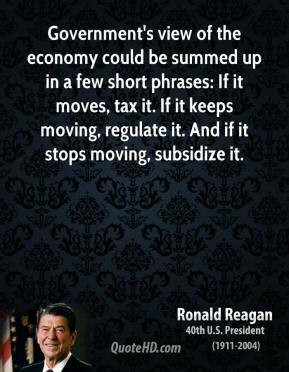 I think that the bottom line is that for people thinking that the economy is slowing down, that is certainly not the case. European debt is pricing in a perennial recession. 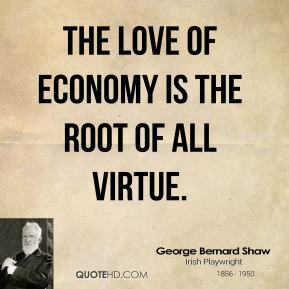 Sooner or later the European economy will revive and then we will see bond prices fall. 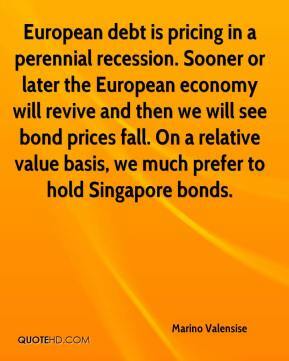 On a relative value basis, we much prefer to hold Singapore bonds. 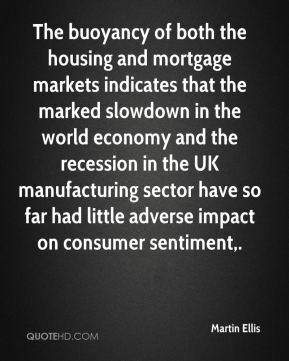 The buoyancy of both the housing and mortgage markets indicates that the marked slowdown in the world economy and the recession in the UK manufacturing sector have so far had little adverse impact on consumer sentiment. 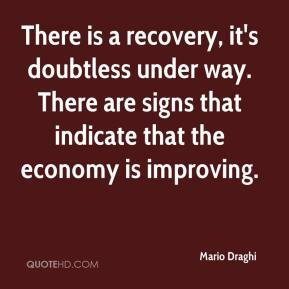 There is a recovery, it's doubtless under way. 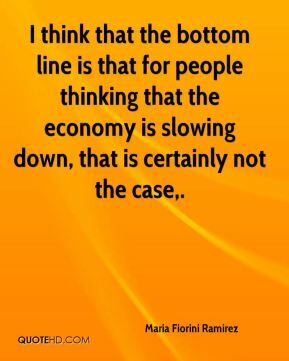 There are signs that indicate that the economy is improving.